We’d love your help. Let us know what’s wrong with this preview of Easter Bride by Shanna Hatfield. Valentine Bride (Book 1) - Fynlee Dale returns to Holiday to take care of her wacky grandmother. Carson Ford vows to look after his elderly aunt after buying her ranch. They find themselves in the midst of a plot by two scheming old women determined to make them fall in love. Summer Bride (Book 2) - Sage Presley doesn’t have time for a man in her life beyond the teenage brother she’s raising. Too bad no one let two scheming matchmakers know. . .
Easter Bride (Book 3) - Colton Ford needs a place to hang his hat for a while, not an opportunity to fall in love. To ask other readers questions about Easter Bride, please sign up. This is another really wonderful story in Ms. Hatfield’s Holiday Brides, a contemporary story. I love Piper our heroine and all her crazy animals she rescues. I love how she is so happy managing who grandpas’ feed store and she is happy doing it and taking care of the crazy menagerie of her rescue animals. Colt is a handsome and wonderful hero who isn’t looking for love but his brother convinces him to go help Piper with her horse she rescued whose hooves do not look healthy and needs helps. He This is another really wonderful story in Ms. Hatfield’s Holiday Brides, a contemporary story. I love Piper our heroine and all her crazy animals she rescues. I love how she is so happy managing who grandpas’ feed store and she is happy doing it and taking care of the crazy menagerie of her rescue animals. Colt is a handsome and wonderful hero who isn’t looking for love but his brother convinces him to go help Piper with her horse she rescued whose hooves do not look healthy and needs helps. He and his wife also tell him just how pretty Piper is. His first introduction to Piper is pretty much an interesting event as he rolls onto her land and gets out of his truck and he hears a woman’s voice coming from a pig pen as she is talking to what he is not certain. She pops up and goes right back down into the bed so embarrassed that someone has seen her full of muck and mud. She finally just comes back up as he is walking to the pen and steps out with a goat in her arms. Can you imagine you watching this scene unfolding before your eyes after his brother and sister in law built this woman up as beautiful? This story had me laughing so much as three octogenarians try to get these two you people together and the two young people and one of the octogenarians wants them to help her get the other two octogenarians together. It is a fun story full of surprises and antics that you are drawn in right from the beginning and read it non stop until the end. I loved this one and Ms. Hatfield can write the best stories that has sass, wit and just plain funny events that keep you laughing and reading. And of course, there might just be a happy ending. I highly recommend this story as I do all of her stories. I received this arc from the author without pressure or even asked to review. I am writing this review because I honestly loved this story and wanted to without any compensation to do so and no asking me to. This is my honest and own opinion on this story. She rescues animals. Who will rescue her dreams? As you can see if you search my reviews by author or read the list of books I've read on Goodreads, I really like those by Shanna Hatfield. Her stories are heartwarming, creative, and fun. It was a no-brainer that I would read Easter Bride and enjoy. . . Neither Piper nor Colton had any intention of even falling into like with each other. Their goal was merely to get her grandfather and his aunt together. But they didn't take meddling Matilda into c She rescues animals. Who will rescue her dreams? Neither Piper nor Colton had any intention of even falling into like with each other. Their goal was merely to get her grandfather and his aunt together. But they didn't take meddling Matilda into consideration. You're heard of a ""meet cute"", right? Well, I wonder if it counts if she is covered in pig and goat . . . mud. Maybe this story has a ""meet ugly"" or ""meet stinky"". With Piper's propensity to rescue and adopt animals, there are plenty of cute moments in this book. Especially the feed store ""chick-mageddon"" and the vampire bunny incident. Yet the story is not over-the-top or ridiculous. It is heartwarming and has its share of internal struggles as Piper fights feelings of inadequacy and Colton struggles with what his future will be like when he has to leave Holiday. If you are looking for a sweet romance that will warm your heart, this one just might fit the bill. This book is amazing. I have read a few romances in between my normal reads and this is one that sticks out for several reasons and that is because it is so sweet and swoony and a second chance romance for one couple and a romance for the other couple. Piper works at her grandfather's farm and feed store in Holiday, Oregon. She loves working at the store and loves the farm but she is sad to see it go because her grandfather is selling the farm and the store. He is going to start his new life afte This book is amazing. I have read a few romances in between my normal reads and this is one that sticks out for several reasons and that is because it is so sweet and swoony and a second chance romance for one couple and a romance for the other couple. Piper works at her grandfather's farm and feed store in Holiday, Oregon. She loves working at the store and loves the farm but she is sad to see it go because her grandfather is selling the farm and the store. He is going to start his new life after losing his wife. He decides to let a match maker set him up with a widower and he agrees. Piper is so excited she has decided she is going to help in the match making what she never thought was that she would fall in love to. Colton is stuck in a rut and he knows he has to decide where to go in life so when his brother tells him to come down to the ranch for some rest and relaxation he decides to go to Holiday. Then his aunt is going on a date and he decides to help out and when he does and meets the suitors granddaughter he never though he would fall in love. 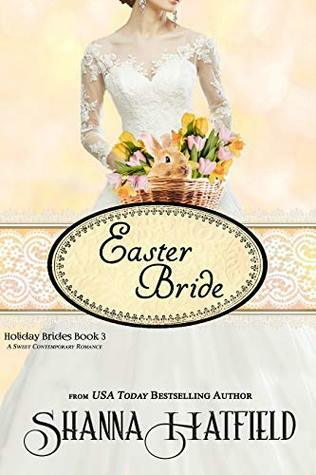 I am a bit embarrassed to admit this but I didn't realize this was the third book in the Holiday Brides series by Ms. Hatfield when I started reading, Easter Bride. I only mention this because this book is so good that I am sorry I missed reading the first two but I will be reading them as soon as possible. I absolutely adored Piper Peterson from the start and could imagine being friends with her. She loves animals so much that she has rescued quite a few of them. she loves living in a small town I am a bit embarrassed to admit this but I didn't realize this was the third book in the Holiday Brides series by Ms. Hatfield when I started reading, Easter Bride. I only mention this because this book is so good that I am sorry I missed reading the first two but I will be reading them as soon as possible. I absolutely adored Piper Peterson from the start and could imagine being friends with her. She loves animals so much that she has rescued quite a few of them. she loves living in a small town and the girl has a flair for decorating that made me want to visit the feed store she manages. I loved the way the author described the antiques she used in some of her displays so that I could visualize them. I love her kindness not only for animals but for her aging grandfather as well. Now there has to be a hero for the heroine, right? Of course and boy did the author create the perfect one in Colton Ford! . They first meeting is a bit off putting to him but I sure had a good laugh and that's when I realized how much I liked her. I'll just say there is a pig pen, mud and a goat involved making Piper not nearly as beautiful as Colton had been led to believe. The community of Holiday is filled with fun, lovable and quirky characters who happen to have each others backs and are not opposed to offering sage advice to those they think need it. Family, friends and neighbors are always important in a storyline and the author highlights and nurtures these relationships in the quick and fun read. If anyone is looking for a fast weekend read, I highly recommend this one. I received an e-copy from the author and was under no obligations to write a review. All opinions are my own. Piper Peterson, trained as a veterinary technician, is living on her grandfather's ranch and managing his feed store until he can find a buyer. Colton Ford is staying with his brother until he can find a place of his own to raise and train Quarter horses. A former farrier, Colton's brother asks him to have a look at a horse that Piper has rescued. Piper's grandfather, Rand, has been pursuing Colton's aunt, Ruth, both widowed, in their eighties and living in a retirement home, but Ruth keeps reje Piper Peterson, trained as a veterinary technician, is living on her grandfather's ranch and managing his feed store until he can find a buyer. Colton Ford is staying with his brother until he can find a place of his own to raise and train Quarter horses. A former farrier, Colton's brother asks him to have a look at a horse that Piper has rescued. Piper's grandfather, Rand, has been pursuing Colton's aunt, Ruth, both widowed, in their eighties and living in a retirement home, but Ruth keeps rejecting him. Matilda, Ruth's friend, asks Piper and Colton to take them out to eat and "accidentally" run into each other to try to change Ruth's mind. At the same time, Matilda has asked Rand and Ruth to have Piper and Colton take them out to eat every Friday night so that Piper and Colton can fall in love. Shanna Hatfield's third Holiday Brides book, Easter Bride, is wonderful and so descriptive. I loved every moment of Piper and Colton's story. Not only does it reinforce the belief that love finds you when you least expect it, but waiting for the right one brings a lifetime of love and laughter - including a barnyard full of adorable animals in this case. The respect and care each of them showed to their family and elderly relatives was especially touching and very meaningful to me. The Easter Bride (Book #3 in the Holiday Bride series) is a wonderfully crafted contemporary romance by the incomparable Shanna Hatfield. Piper Peterson is a delightful heroine, part tomboy, part girlie-girl, and all sass and heart. Her love for animals, from Charlie the rescued horse to Brer Stoker, the grumpy bunny, and a feed store full of baby chicks is sure to win your heart…just as she won Colton heart. Colton Ford knows he wants to breed horses but isn’t sure how he can go about it. He’s a The Easter Bride (Book #3 in the Holiday Bride series) is a wonderfully crafted contemporary romance by the incomparable Shanna Hatfield. Piper Peterson is a delightful heroine, part tomboy, part girlie-girl, and all sass and heart. Her love for animals, from Charlie the rescued horse to Brer Stoker, the grumpy bunny, and a feed store full of baby chicks is sure to win your heart…just as she won Colton heart. Colton Ford knows he wants to breed horses but isn’t sure how he can go about it. He’s also unsure about getting involved with a woman…until he meets Piper slogging through muck and mire to rescue a goat. Despite his brother and sister-in-law’s claim that Piper is an attractive woman, Colt just can’t see it through the slick mud clinging to her from her head to her toes…until he sees her beautiful blue eyes. Add a dash of three feisty, unstoppable octogenarians and you have the recipe for a fun, lighthearted spring romance that will keep you laughing and reading. Ms. Hatfield continues to charm her readers with delightfully fun characters, ornery animals, and a sweet romance that will steal your heart and put a spring in your step. I received this ARC from the author. This is my honest review without any pressure or compensation to do so. I’m a lover of books, romantic stories, and sweet happy endings. Since I’ve discovered Shanna Hatfield I’ve been in an euphoric bliss. She’s truly raised the bar and I find myself comparing other authors books to Shanna’s. It is really hard to find an author that gives me this sweet happy feeling every time. If you’re looking for a sweet happy no stress romantic book I highly suggest her newest: Easter Bride. Colt and Piper have wiggled their way into my heart and soul for eternity. Ruth and Matil I’m a lover of books, romantic stories, and sweet happy endings. Since I’ve discovered Shanna Hatfield I’ve been in an euphoric bliss. Colt and Piper have wiggled their way into my heart and soul for eternity. Ruth and Matilda are two matchmaking genus’s who will keep you in stitches laughing. I guarantee Ruth and Rand will just melt you! If you love animals then get ready to fall in love with Charlie, Doggie, and Piper’s other rescued sweethearts. I know whenever I start reading one of Shanna Hatfield’s books, I am going to be smiling from ear to ear and this one did not disappoint! I felt so bad for Piper when Colton came to her farm…no woman wants their first impression to consist of head to toe mud and muck from a barnyard! She took it all in stride and didn’t let that hiccup ruin future encounters with Colton! While I enjoyed their journey to love, I also very much appreciated the addition of the second love story between Rand and Rut I know whenever I start reading one of Shanna Hatfield’s books, I am going to be smiling from ear to ear and this one did not disappoint! I felt so bad for Piper when Colton came to her farm…no woman wants their first impression to consist of head to toe mud and muck from a barnyard! She took it all in stride and didn’t let that hiccup ruin future encounters with Colton! While I enjoyed their journey to love, I also very much appreciated the addition of the second love story between Rand and Ruth. There were definitely plenty of characters with grit, determination and fun…a winning combination! I highly recommend this story if you are looking for a quick read that will make you smile! I received a complimentary copy of this book, but the review is my honest opinion. If you've read any of my blogs, then you know I love Shanna's books. Congratulations to Shanna on her new release "Easter Bride". It's a great choice to read as we are now in Spring. The characters are fun and love-able. You'll see some familiar people especially Ruth and Matilda. I loved the plot Matilda comes up with to play matchmaker. This lady cracks me up, she is hilarious! I always enjoy the animals Shanna weaves in throughout the pages. They are fun, quirky and the names will keep you s If you've read any of my blogs, then you know I love Shanna's books. Congratulations to Shanna on her new release "Easter Bride". It's a great choice to read as we are now in Spring. The characters are fun and love-able. You'll see some familiar people especially Ruth and Matilda. I loved the plot Matilda comes up with to play matchmaker. This lady cracks me up, she is hilarious! I always enjoy the animals Shanna weaves in throughout the pages. They are fun, quirky and the names will keep you smiling. A great book and a great story!. Colton isn’t very impressed with Piper the first time he sees her covered in mud chasing a goat ...... until he looks in her eyes. They like each other but are both on a turning point in their life. They’re happy to help the local matchmaker to match her grandfather with his aunt and that they spend some time together isn’t bad. But can they become more then friends when their future is uncertain? This is a sweet fun, romantic story including some very remarkable animals that you will love. I reall Colton isn’t very impressed with Piper the first time he sees her covered in mud chasing a goat ...... until he looks in her eyes. Easter Bride: A Sweet Romance! This is my voluntary review of an Advance Reader Copy of this book. Not only are all the characters well done, but the story itself is fantastic! Although this is Book 3 in a series, it works as a stand-alone. There are many laugh-out-loud moments, as well as a few serious bits, mixed in this sweet romance. I adored reading this book! It's a refreshing & sweet story. charm & romance, make it the perfect read. Well, Matilda & Ruth, the resident HPH matchmakers, are at it again. And this time, Matilda has secretly planned, something else. I enjoyed everything about the book! the very first pages to the last. Shanna Hatfield's holiday romance made me chuckle with its combination of feisty retirees, two delightful matchmakers, an assortment of mischievous animals, two young people's love for their elders, a scrumptious spring recipe, a wedding and twist and turn plot. A well crafted spring read. This is a clean sweet romance that will have you laughing and thinking you are down on the farm with these folks! I highly enjoyed the story and the animals just made it that much more fun! Thanks Shanna for another great read! There is nothing like matchmaking with a twist. People can find love no matter how old or young they are. I’ve never read a story like this and it was very good. This is a super fun story with wonderful characters, rescue animals with unique names and chick-ageddon. The funny way Piper and Colt meet for the first time is priceless and the way the story wraps up is lovely. I received a complimentary copy and I am voluntarily reviewing. Sweet, entertaining, and hilarious. What more could you want in a romance? Sometimes we readers need something that is lighthearted; something that brightens our hearts and puts a lasting smile on our faces. This story was really great with a lot of fun and funny characters. I loved the family farm and store. It sounded like a wonderful place. This is a sweet, clean romance. This was a sweet easy to read story.I enjoyed it, but there was no suspense. Everything just happened as it should. Match makers at work and great laughs. It’s so nice to see love work in the young and in the older people. Enjoyed the book and I am sure you will too. A wonderful romantic story with animals and friends and adventures that make you want to visit and walk through the town and have lunch with the people. Well done. Great addition to this fun series. The matchmakers are at it again with Piper and Colton being their targets. Their first meeting was pretty funny. A really sweet read with a twist I loved. Great ending. This review has been hidden because it contains spoilers. To view it, click here. A very cute Easter Story. She finds love and gets her store.What more could she want. A hopeless romantic with a bit of sarcasm thrown in for good measure, Shanna Hatfield is a best-selling author of clean romantic fiction written with a healthy dose of humor. In addition to blogging and eating too much chocolate, she is completely smitten with her husband, lovingly known as Captain Cavedweller. Shanna creates character-driven romances with realistic heroes and heroines. Her histor A hopeless romantic with a bit of sarcasm thrown in for good measure, Shanna Hatfield is a best-selling author of clean romantic fiction written with a healthy dose of humor.